This week Little Miss I went on to China on our cook travels to learn and make one of her favorite dishes: Chinese Dumplings. We were both pretty surprised on how easy it was to put them together; it is time consuming, but easy enough for a 5 year-old to do. And we had a chance to talk and spend time together while we were doing them. When we finally finished the entire batch and steamed them for dinner, she ended up having 10 of these!! They were very yummy, and daddy approved too. I tried finding a legend on dumplings and Chinese culture, but ended up getting a ton! Some people talk about a very poor family that didn’t have anything to eat but frozen vegetables and very little flour for a new year meal. When a God saw how much the family was trying to scrape together to have something to eat, he gave the family gold and food to celebrate. There’s another story about a man getting lost in a cave in a mountain with two spirits playing a game of tiles, and eating the dumplings — just to find out they were magical and made time go super fast. He walked out of the cave to find his little town transformed into a city, and his family long gone. There’s even a third story about a doctor using all his herbs and knowledge to cure diseases using soups and dumplings, which contained the medical herbs in yummy concoctions. Fresh Chinese steamed dumplings filled with pork and cabbage. 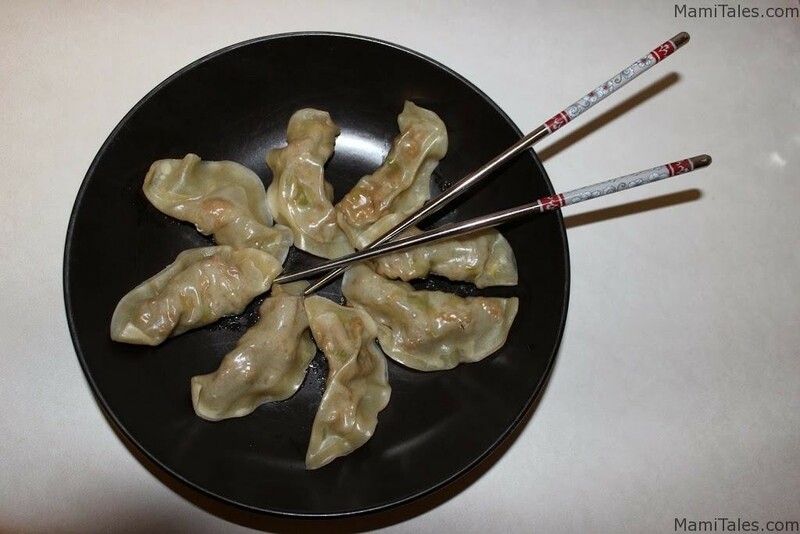 Using gyoza skins, these are very easy to make! Place a large pan under medium heat. Pour the sesame oil and cook until hot, but not smoking. Add the spring onions and cook for about 3 minutes, then add the garlic and ginger. Cook 2 more minutes, then add the ground pork. Break the lumps and making sure it is cooked all through. Add the soy sauce and mix well, cooking for another 3 minutes, until the meat is no longer pink. Let cool. Once the meat mixture has cooled off, open the gyoza skin package and place one sheet on a plate or board, where you'll be making the dumplings. Put about 1 TBSP of filling in the center of the sheet, dab the sides of the sheet with cold water and then close the dumpling, using your fingers to make sure it is all well sealed up. Place on a dish and keep doing the same until you've used up all the filling. In a steamer put enough water to boil. Use the whole cabbage leaves to line the steamer part, then place as many dumpling as you can fit in one single layer. Steam for 5 minutes, remove and place more dumplings to cook. Serve the hot dumplings with a little soy sauce and enjoy! You can also use baby bok choi instead of cabbage, or marinate the pork for about 30 minutes in soy sauce previous to cooking. Tagged Book reviews-recipes, Cooking with Children, Savory recipes. I love chinese food but never tried to make my own dumplings! They sound amazing but the ingredients are really hard to find here. Maybe one day..